The Great Tropical Drive is the ultimate adventure road trip: this internationally renowned self-drive tour features immaculate beaches, fascinating heritage towns and some of the oldest continually surviving rainforests on earth. Your journey starts in Cairns, where you can choose between no less than eight beaches, all within close proximity to World Heritage–listed rainforests that are home to some of the rarest and most exotic flora and fauna on Earth. Take the family for a relaxing picnic or spend an afternoon playing cricket beside the waves at Machans Beach. Not far away, delve into the heart of the forest at the Daintree Rainforest, where time itself seems to slow down to admire this astounding forest, believed to be more than 135 million years old – older than even the Amazon. 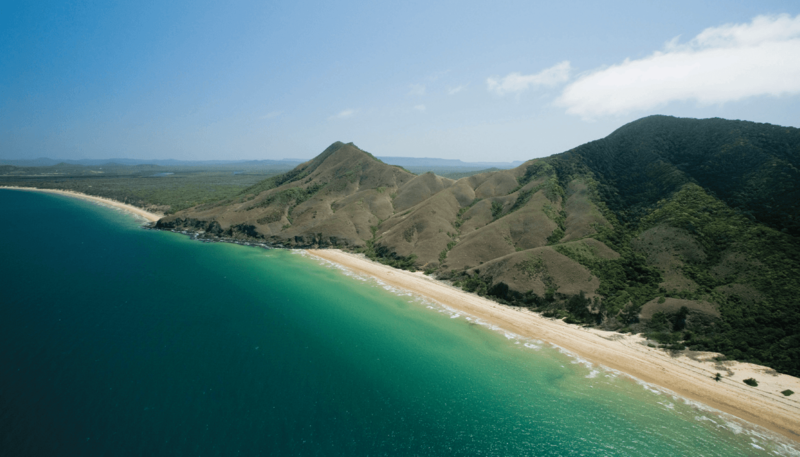 The Daintree and Great Barrier Reef region is also the only place on Earth where two World Heritage sites meet, making it the perfect scenic spot to escape for a weekend. Stepping out of the forest and adjusting to the road might be difficult after your Daintree adventure, but your discipline will be rewarded when you arrive in Cooktown. Explore the history of the region’s original inhabitants, the Gungarde people, by visiting the Milbi Wall (also known as the Story Wall), a beautiful reconciliation project erected at the location where James Cook and his crew disembarked in 1770. Wake up in coffee country with an inland journey to Mareeba, where more than 70 per cent of Australia’s coffee crop is produced. Embark on a coffee plantation tour or indulge in a drink and dessert at the Mt Uncle Distillery. There are also tropical fruit farms waiting to be explored, where you can sample remarkable and surprising fruits. Alternately, go birdwatching in one of Australia’s premier birdwatching locations, home to some of the most majestic and colourful birds on the planet. For a different perspective, take a hot air balloon journey over the region, and take in spectacular views of the living mosaic tablelands as they unfold below you. If you have a preference for solid ground, visit Undara to venture underground at the Undara Volcanic National Park. The park is home to one of the world’s longest lava tube caves, an impressive cavern hidden underneath a deceptive layer of grass and brush. It’s a place that sums up the entire Great Tropical Drive – you have to see it to believe it!